Part of the Cloudy Pk, rock climbing area. On the prominent buttress leading directly to the true summit of Mt Onslow (2310m), located at the head of the valley on the right of Cloudy Stream valley, about 30 min walk upstream from the usual camp site. On the Onslow Wall, left of Onslow Buttress. 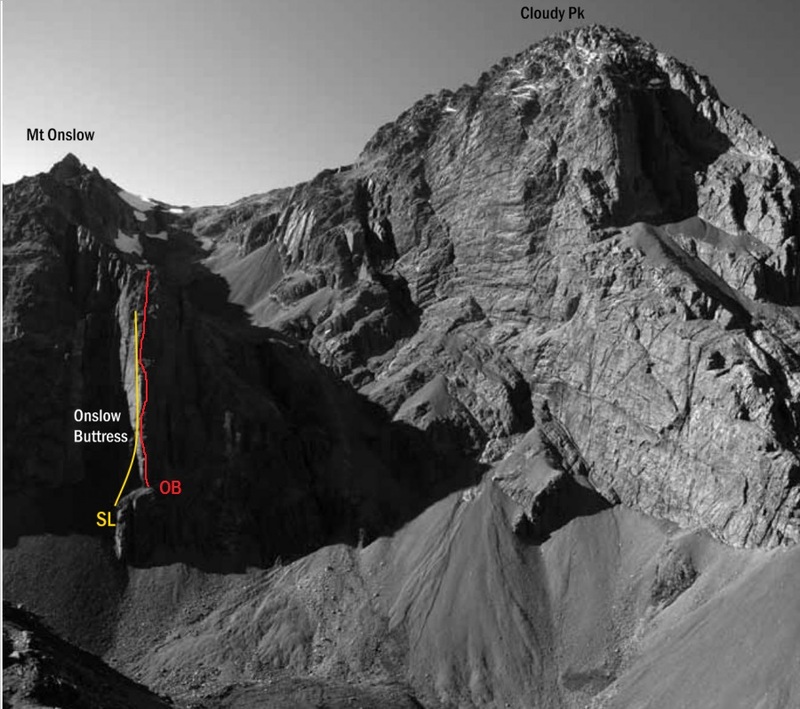 Climb scree to its highest point on the left of the face, then up the left side of a gully to reach belay bolts. Six sustained pitches on the central part of the face, with some bolts. Move right to short corner, up this a few metres to 1st bolt on wall. Move onto face and climb seams passing another bolt. The seams angle slightly left and the route follows that line up the face. Passing a bolt in dark juggy rock, then another above a small ledge. From there the route goes straight up passing two more bolts, directly to belay bolts beneath 1st overhang. 6B, few extra runners can be used. Straight up past 2 bolts to obvious feature on the overhang. Slightly left-wards line up past a bolt and up to the ‘Witches Hat’. Straight up face to bolt then step left and up to V shaped ledge. Up right to bolt, then straight up through overhang to belay bolts beneath overhang. Move left up to bolt on face above overhang. Onto face and up to crack for runners, then move left and climb up to gain two seams heading up the face tending slightly right. Towards the top the left seam stops and the right seam becomes a crack. Belay bolts on ledge above this. Ample natural pro on face. Step left around corner onto face. Follow obvious left- wards rising traverse past 2B. Then up face tending slightly L, about ten metres to a bolt above a small ledge. Continue up same line to belay bolts in V shaped stance. Move left to bolt, then up seams to ledge. Directly up face past another bolt. Then tend slightly left- wards up face on juggy rock to belay bolts on major ledge. Climb juggy wall to gain corner about ten metres up. Follow up corner and over bulges. The angle eases above bulges. Final belay bolt is in the corner when level with terrace on right. Three moderate pitches to reach a stunning full rope-length on the smooth diamond-shaped slab, with just one jug at about two-thirds height. Then a short final pitch to reach abseil bolts. Take plenty of quickdraws. Start just right of gully, climb up then move right onto face and up. Face is sound, few runners. Up easy ground tending a little left to belay bolts on main ledge. From belay on ledge move right to belay bolts on face. Route climbs straight up from face belay. A bolt on the face is passed on its left. Up and right to gain the left- facing corner where cracks take runners. Up and right round corner, up to belay bolts beneath overhang. Climb overhang past 2B. Continue up left- facing corner (1B near top). Then up and tending right towards big left- facing corner. 1B in this corner marks the point to traverse right around onto face. Then up to belay bolts. Sustained. 11B. Straight up to 1st bolt. Above 1st bolt is a cam placement, then move left up to 2nd bolt. left and up to the 3rd bolt, then straight up face passing bolts. There are two wire placements at obvious points where bolts are spaced. At top of pitch move left to belay bolts. Use nut pick to remove wires. Climb easy face straight up to belay bolts on top. Start a little right of the toe of the buttress and scramble up a bit to gain the crest. Straightforward climbing with spaced gear to reach a large platform with an old bolt station. Nice climbing protected by microcams, with a committing move to the right after about 20 metres. Continue up the right side, moving back to the crest for the belay. Continue up the right side of the buttress. Gain the lower-angled area and scramble a full pitch with no protection. Belay under the overhang just right of the buttress and pull through on good holds. Nice climbing with good microcams. Climb out left on to steep broken ground with good gear and protection, then above the ledge move up through big blocks on the right. Broken ground with steeper sections and scrambling intermingled. Mostly scrambling with a couple of steeper sections leading to the final top out on the pinnacle summit. The first ascent was made from Broadleaf Hut. Once on the ridge the final 400 metres of rock are steep and tricky.